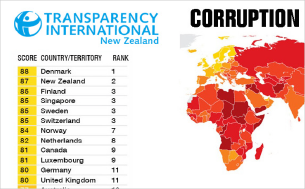 The latest corruption perception index (CPI) scores were the subject of much discussion at the February Leaders Integrity Forum, convened by Transparency International New Zealand (TINZ) and hosted by the Auditor-General. When John Ryan introduced the topic for the Forum, he talked about the importance of New Zealand’s CPI score. It goes to the heart of our perceived integrity as a nation. In John’s view, that integrity – along with our ingenuity and our kaitiaki mindset – is integral to New Zealand’s story. It impacts on how we’re seen as a nation. The CPI score is a measure focused on the public sector and how it is perceived. It serves New Zealand well that we have a strong working democracy, a reputation for respecting human rights, a merit-based public service, an independent Ombudsman’s Office and independent Auditor-General, and strong and enforceable laws. Other nations are not so fortunate. Another important perceptions score is the Kiwis Count survey. John noted that although the overall score for trust and confidence in the public sector based on direct experience is high, that overall score masks some issues for the public sector to tackle. As an example, Māori have a comparatively low – and declining – level of trust in the public sector. That isn’t something the public sector should be complacent about... and it’s a topic we may well come back to. Julie Haggie from TINZ was the first speaker introduced by John. Her presentation about how New Zealand’s score had moved and why (looking at the stories in the media at the time that critical surveys about perceived corruption levels were carried out) was certainly thought-provoking. Is the perceived level of wrong-doing here higher for 2018 because we’re talking about it and prosecuting people more often? Or is there an increased level of fraudulent or corrupt activity? The drop keeps people on the edge of their seats – are we really still bouncing around, or is this the start of a pattern of decline? Those working most closely on combatting fraud and corruption tell us that it isn’t a misplaced perception – people working in our integrity agencies are seeing more instances of deliberate and pre-meditated fraud. So although this post has an analogy of playful movement at the top of the CPI table, as a nation we really cannot afford to be complacent. New Zealand’s international reputation – as a safe place to do business with and a safe place to travel to – is essential to our economy. Speaking of trade, it was also interesting when Julie pointed out where New Zealand’s major trade partners sit. Spare a thought for America. Thanks to the tone at the top in the USA, America has dropped out of the top 20 for the first time since 2011. So how does a country like ours start to tackle a slow but potentially damaging increase in fraud and wrong-doing? That’s the cue for the second speaker – Catherine Williams, the Deputy Commissioner responsible for Integrity, Ethics & Standards at the State Services Commission. Catherine started her talk by reminding all of us about the strong spirit of service in our public sector. The people who choose to work in the public sector do so because they want to make a difference. It’s personal, and it’s about integrity. The vast majority of people in our public service want to do the right thing. The State Services Commission has set up Catherine’s team to support that, with a focus on preparing model standards, guidance, and other supporting materials for the public service. They also carry out inquiries and provide awards and recognition to our most decided and impressive front-line public servants. As John noted in his capacity as chairperson for the meeting, the State Services Commission has the whole range covered – actively helping people to do the right thing, investigating when they don’t, and holding people up for acclaim when they do the right thing incredibly well. Catherine noted that the awards and recognition aspect of her role has given her some of the best moments in her public service career thus far. Getting back on top of the Corruption Perceptions Index isn’t about beating Denmark. Given the importance of our international reputation to trade and our economy, and the political, social, and economic costs of living in a corrupt society, it really is about protecting our quality of life. That’s worth all of our attention.